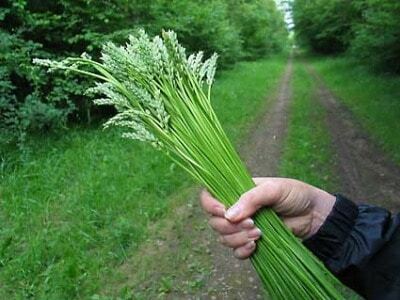 I will start this out with Wild Asparagus, which has a much thinner stalk than the grocery-store variety. One cooked cup of his green vegetable is packed with nutrients, including 101% of the DV of vitamin k, 67% of your folate, 33% of your copper, 24% of your vitamin B-1 and 20% of your selenium! But it doesn't stop there! Asparagus also contains Quercetin, one of the best researched flavonoids in nutrition. Intake of this flavonoid has been linked to reduced risk of numerous cardiovascular diseases. This is much better than the stuff you will pick up in the produce section at your local supermarket. Plus it's free! This powerhouse plant grows in the wild in most of Europe and parts of North Africa, West Asia, and North America. Wild edibles can take the form of not so common foods as well. Take the dandelion for instance. This plant is typically considered a nuisance to homeowners looking for that pristine lawn. Resulting in the use of chemical herbicides and other means to remove them. When in reality they are a nutrient packed flowering plant that mother nature has given us for many purposes. This entire plant is edible, the roots, stems and leaves. One cup of dandelion greens contains 25 calories, 42mg of sodium, 218mg of potassium, 5g of carbohydrates, 7% DV of fiber, 535% DV of vitamin K, 111% DV of vitamin A, 32% DV of vitamin C, 5% DV of vitamin B6, 10% DV of calcium, 9% DV of iron and 5% DV of magnesium! When eating the leaves, make sure the plant is still young. Mature leaves on these plants will taste bitter. If you do decide to eat the older leaves, boiling them first can help remove some of the bitter taste. Boiling the roots before you eat them is also recommended, after which you can drink the water as a tea. This tea has been used for thousands of years in various treatments. Ethnobotanists suggestthat the Bible’s “bitter herbs” could be one of dandelion’s earliest medicinal references. As well as later recordings in 659 A.D by Asian physicians on its healing properties and effectiveness in treating digestive disorders. One this is for certain, this "weed" is a time tested medicinal plant, who's benefits outweigh the hindrance it puts on your lawn. The last wild edible I am going to cover is another common "weed" thats not commonly known as a health food or food at all. That weed is called purslane and it can provide much needed vitamins and minerals. This powerhouse tops the list of plants containing vitamin E and an essential omega-3 fatty acid called alpha-linolenic acid (ALA). This fatty acid has been identified as a potential nutraceutical to protect the brain from stroke, characterized by its pleiotropic effects in neuroprotection, vasodilation of brain arteries, and neuroplasticity. Not only that, but lack of these omega-3 fatty acids have been linked to Alzheimer's disease. Purslane can be a powerful plant protector of the brain! After learning all that, this plant seems more like a necessity than a nuisance. A resilient necessity I might add. This plant grows right up throw the rocks in my yard and everywhere else! Do yourself a favor and incorporate some wild edibles in your diet, to become as resilient as these "weeds"!